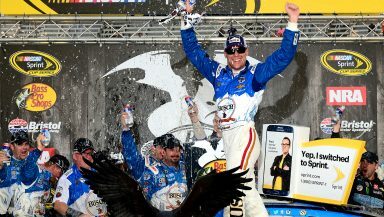 BRISTOL, Tenn. — It took 24 hours to finally settle the results of the night race at Bristol and Kevin Harvick found himself in victory lane as the Sun set over Northeast Tennessee. The 56th running of the Bass Pro Shops NRA Night Race was scheduled to start last night at 8:15, but weather delayed the start by nearly 30 minutes. Carl Edwards led the field to the green flag at 9:03 p.m. but lost the lead to teammate Denny Hamlin and wasn’t threatening to win much after that. The lead swapped back and forth between Chase Elliott and Kyle Busch for the first 30 laps before rain brought out the first caution of the race. After a one hour, 24-minute and four-second red flag period, the cars rolled back off pit road for 10 laps before more rain forced NASCAR to postpone the remainder of the race to Sunday. A scheduled start of 1 p.m. was pushed back by constant rain. Eventually, the red flag was withdrawn at 4:33 p.m. and the race restarted on lap 58. Most of the first half of the race was dominated by Busch. After the halfway mark, Harvick moved in to take control of the race. Busch’s car suffered a part’s failure and spun out in Turn 2 on lap 359. As his car say lifeless in the middle of the track, Justin Allgaier, tried to avoid him but collided with the car. Allgaier’s car continued up track and collected Martin Truex Jr. and Kyle Larson. Calamity continued two laps after the ensuing restart when race leader Kurt Busch got loose exiting Turn 2 and slid down into Brad Keselowski. As the field slowed down to avoid the spinning Busch and Keselowski, Elliott slammed into the rear of Matt Kenseth and sent him into the rear of Jimmie Johnson and the wall. Harvick dominated most of the rest of the race and drove on to score the victory. It’s his 33rd career victory in 561 Sprint Cup Series starts, second of 2016, second at Bristol Motor Speedway, his 18th top-10 finish of the season and 15th top-10 finish in 32 starts at Bristol. Ricky Stenhouse Jr. finished runner-up in his No. 17 Roush Fenway Racing Ford. It’s his fifth top-10 finish of 2016 and fourth in eight races at Bristol. Denny Hamlin recovered from a speeding penalty and a loose wheel that put him two laps down to round out the podium in his No. 11 Joe Gibbs Racing Toyota. Austin Dillon finished fourth in his No. 3 Richard Childress Racing Chevrolet. Chris Buescher was the highest finishing rookie as he rounded out the top-five in his No. 34 Front Row Motorsports Ford. Edwards came home sixth in his No. 19 JGR Toyota. Johnson recovered from being caught in the wreck with 127 laps to go to finish seventh in his No. 48 Hendrick Motorsports Chevrolet. Jamie McMurray finished eighth in his No. 1 Chip Ganassi Racing Chevrolet. AJ Allmendinger finished ninth in his No. 47 JTG Daugherty Racing Chevrolet. Joey Logano rounded out the top-10 in his No. 22 Team Penske Ford. The race lasted three hours, 25 minutes and five seconds at an average speed of 77.968 mph. There were 20 lead changes among eight different drivers and nine cautions for 106 laps. Harvick leaves Bristol with a 27-point lead over Keselowski in the points standings.